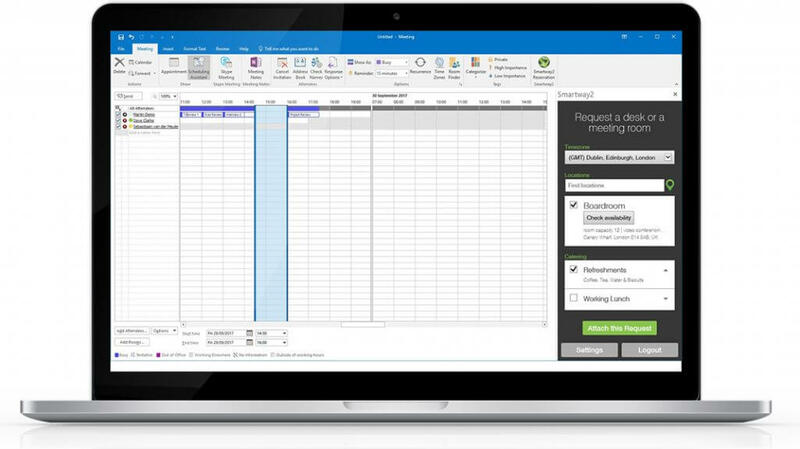 Do you use Microsoft Outlook to schedule meetings at work? If so, it’s no surprise. A culture of Outlook calendar invitations is prevalent in most companies we talk to. Yet there’s more to the story. It’s a great tool to start with – the obvious choice, you might say. But many people don’t see it as a viable long-term solution for meeting room management. Until now, that is… because Outlook room booking and meeting scheduling just got a whole lot easier. More clients (and colleagues) means more meetings. More meetings means more Outlook room bookings. More Outlook room bookings means higher demand for services like catering, AV equipment, or a particular room layout. Ultimately this results in you experiencing more mix-ups, more chopping and changing and ultimately wasting vast amounts of time on back-and-forth communication. Aligning the planets so a bunch of busy people all show up for your meeting is no mean feat. Typically your inbox gets bombarded with declines and cancellations, as you struggle to find a time that suits everyone. When those planets do finally align, it’s too early to jump for joy. If you use Outlook on a daily basis chances are you’ve experienced a certain sinking feeling. The time and date is sorted and firm in everyone’s diary (at long last), but it turns out no meeting rooms are available. Nice. Soon you’re running around, trying to find out who has booked the boardroom so you can launch a charm offensive – or failing that, bribery. All in an attempt to convince them to relinquish their room. “Sorry but no way,” is the classic response, “I spent more time arranging this meeting than we’ll spend actually having the meeting!” You can sympathise. But you still ain’t got no room. In today’s fast-paced office environment, busy people’s best laid plans are bound to go awry now and then. For one thing, there are cancelations. Whether the client couldn’t make it, or the facilitator fell ill, cancelling your meeting sometimes can’t be helped. The trouble is, there’s no easy way for your to handle more complex cancelations and changes in Outlook. Depending on company protocol, you might end up phoning or emailing IT to cancel the LCD screen they were bringing in especially. Or calling Facilities to make sure they don’t show up to lay the room out theatre style. That’s when it becomes easy for you to drop the ball. Even basic cancelations that don’t involve any services often result in no-shows and wasted space. How many times have you walked past an empty meeting room that someone forgot to cancel? Chopping and changing your Outlook room booking? Oops. It turns out you forgot to cancel the original catering order. Bob turned up with a trolley full of sandwiches and refreshments, only to find himself interrupting the CEO mid flow in her video conference. She didn’t want a sandwich. Douglas was right, but when it comes to Outlook room booking, your colleagues may remember you for all the wrong reasons. Many organisations have rules that apply to certain rooms, or services available within those rooms. For example you may not be allowed to reserve an interview room without HR’s approval. Or you may need to give catering 24 hours notice when ordering a drinks reception for clients. The trouble is, people aren’t always aware of these rules and they can be difficult to enforce in Outlook. When it comes to arranging meetings, Outlook room booking functionality doesn’t stretch to validating your reservation against company rules. As a result, you could find yourself booking a space you’re not supposed to book. This typically results in getting kicked out half way through your meeting. Or perhaps you’ve booked an impromptu team meeting, assuming catering can show up with with tea and biscuits on an hour’s notice. Either you end up with tea and biscuits delivered by a stressed-out catering team who’ve had to deal with your last-minute request; or you end up equally unpopular with your team, who suffer the misery and injustice of a tealess, biscuit-free meeting. At Smartway2, we’ve listened to lots of Outlook users to understand their most common complaints. And we’ve done a lot of thinking about how to eliminate them in an easy, cost-effective way. As a result we built the Smartway2 app for Microsoft Outlook. That’s why Outlook room booking just got a whole lot easier. 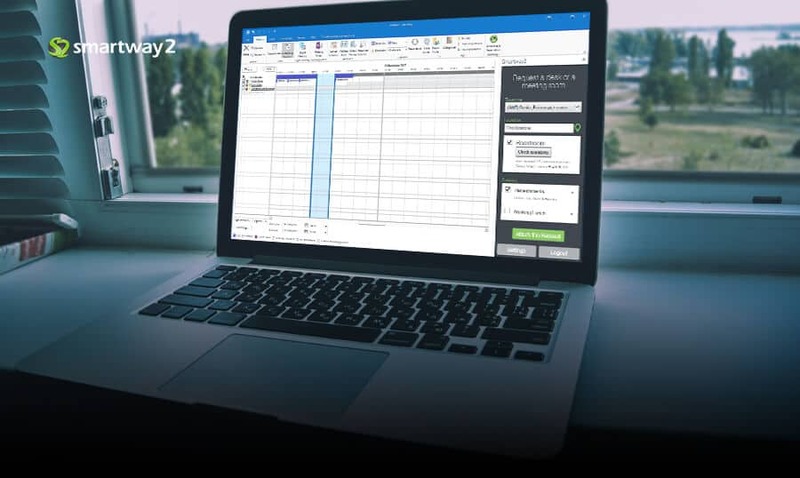 With a one-click installation, Smartway2 brings a smoother, time-saving meeting room booking experience to Outlook, regardless of whether you’re using Outlook for Windows, for Mac, or even Outlook Web Access. Smartway2 ensures that any Outlook room booking you make will instantly appear on meeting room panels and lobby displays. If you’ve invited external visitors, reception will be alerted to expect them. It even works with Skype room systems. Normally, if I want to book a meeting, I go into my Outlook calendar and choose, say, 2pm on Thursday. Then I go to the scheduling assistant and invite my colleagues to attend. I can look at their calendars to find a good time that suits everyone. With Smartway2 installed, you’ll see a button on the toolbar that opens up the user-friendly room booking interface within Outlook. I can easily pick the room I want, say the video conferencing suite. Then I need to confirm I’ll be using the AV equipment (since we have rules in place to prevent people hogging that room). I hit save and we’re done. Then I simply hit ‘send’ in Outlook – the booking turns green in my Outlook calendar and it updates in Smartway2. Not just in the desktop app, but on the meeting room display panels and in the mobile app too. I can move my 2pm meeting to 4pm in Smartway2, go back over to Outlook and see it has changed, instantly. I even get an email confirming the change. All these notification emails are easy to configure and format, however you like. There’s no other meeting room management app that integrates with Outlook in this truly seamless way. No matter which device you’re using, no matter which version of Outlook, everything always looks the same, works the same and updates instantly, everywhere. This is true whether you host Microsoft Exchange on-premise, in the cloud, or use Office 365.